Also, you are all invited to the (free) Boston Azure Bootcamp to be held in the Boston area (Cambridge, MA) on Friday September 30 and Saturday October 1. Sign up here, and please help spread the word. Hope to see some Vermont Code Camp friends there! Let me know if you have a strong desire to “couch surf”, especially on the middle night, and I’ll see if I can help out. Tickets won’t last forever, so I encourage you to sign up sooner than later. Thank you to all the Vermont Code Camp III organizers, volunteers, and sponsors – like last year, this was an inspired event and I’m glad I made the trip. Find them on Twitter at @VTCodeCamp. This entry was posted in Azure, Bill gave a talk, Cloud Computing, Events, Trip Report on September 12, 2011 by Bill Wilder. The July Boston Azure User Group meeting had a tough act to follow: the June meeting included a live, energy-packed Rock, Paper, Azure hacking contest hosted by Jim O’Neil! The winners were chosen completely objectively since the Rock, Paper, Azure server managed the who competition. First prize was taken by two teenagers (Kevin Wilder and T.J. Wilder) whose entry beat out around 10 others (including a number of professional programmers!). 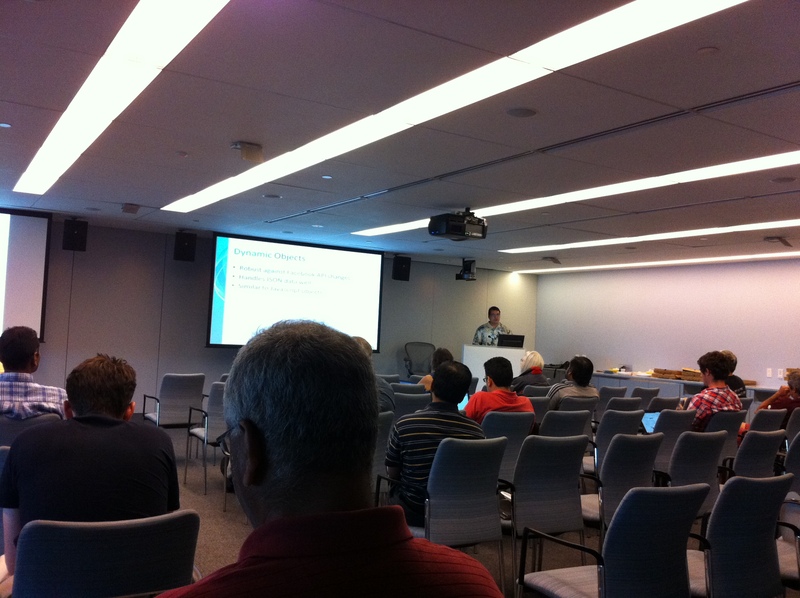 This month’s July Boston Azure User Group meeting was up for the challenge. In the opening act, Bill Wilder (that’s me) introduced the Windows Azure Toolkit for Social Games (see also the Cloud Cover episode 52 which also talks about the toolkit). You can find Bill on Twitter @codingoutloud. Mark Eisenberg of Microsoft then shared some great insights about the cloud and the Windows Azure Platform – what they really are, why they matter, and how they fit into the real world. You can find Mark on Twitter @azurebizandtech. Marshall Rosenstein then talked about building social games for Facebook with an Azure back-end. Marshall’s slides are on his skydrive here (the slides are here, the code download is here). You can find Marshall on Facebook (http://www.facebook.com/marshall.rosensteina) and on Twitter @mrosenstein. 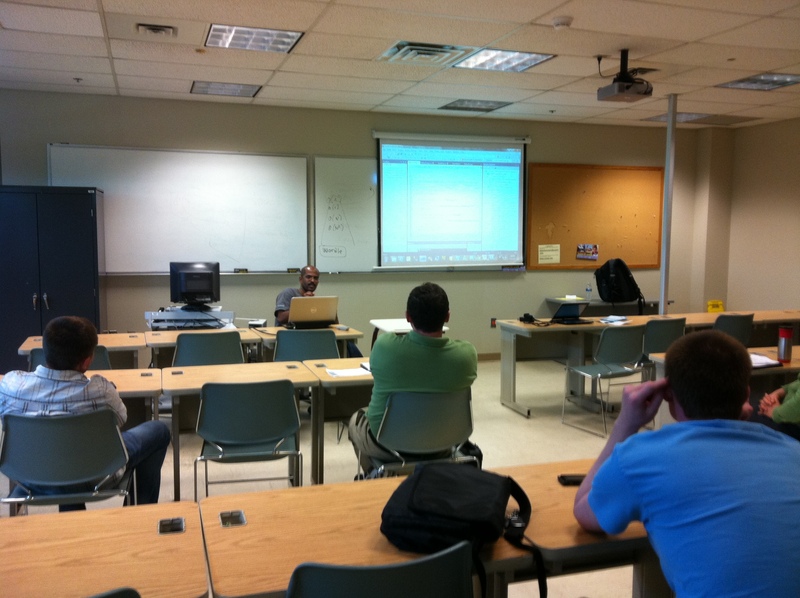 We wrapped up the meeting with a short live demonstration of the Windows Azure Portal doing its thing. Then a few of us retired to the Muddy. Hope to see you at the Boston Azure meeting in August (Windows Phone 7 + Azure), two meetings in September (one in Waltham (first time EVER), and the “usual” one at NERD), and then kicking off a two-day Boston Azure Bootcamp! Details on ALL upcoming Boston-area events of interest to Azure folks (that I know about) can be found in this blog post about Boston-events in August and September. 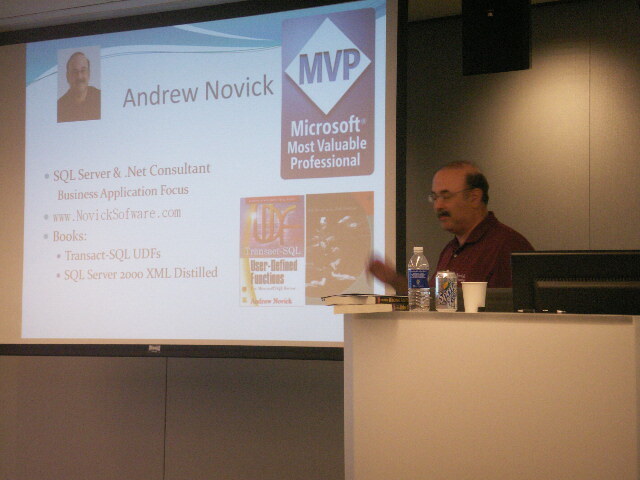 Those hosted by Boston Azure are also at www.bostonazure.org and the upcoming events page. This entry was posted in Azure, Bill gave a talk, Boston Azure User Group, Cloud Computing, Events, Programming, Trip Report and tagged meeting, trip report on July 31, 2011 by Bill Wilder. Today I attended (and spoke at) the New Hampshire Code Camp 3 in Concord, NH. Spoke about the cloud and Azure’s role in the cloud. 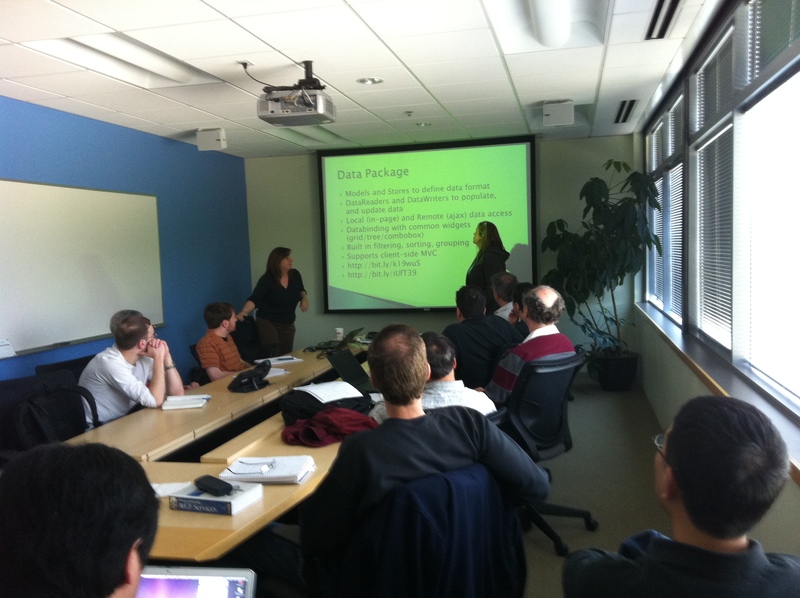 Special thanks to Corinne, Sandra, and Matthew for the excellent questions and discussion. Here is the slide deck (new-hampshire-code-camp-3-concord-bill_wilder-demystifying_cloud_computing_and_azure-04-june-2011.ppt) – though I didn’t use much of it! – we freestyled a lot. Of particular interest to attendees of this talk. check out my post called “Azure FAQ: How much will it cost me to run my application on Windows Azure?” (actually posted “tomorrow” – the day after I posted this note from code camp). Was torn between Phil Denoncourt‘s talk on “25 Things I’ve Learned about C# over the past 10 years” and Andy Novick‘s talk on SQL Azure. Ended up hanging out for Andy’s talk to see if there was anything new in SQL Azure and to get his take on the awesomeness that is SQL Azure Federations. Spoke about Architecture Patterns for the Cloud. Here is the slide deck: New-Hampshire-Code-Camp-3-Concord-_bill_wilder_-_cloud_scalability_patterns_in_windows_azure_platform_-_04-june-2011 – we talked focused on three specific scalability patterns and how you might implement those on the Windows Azure Platform: Sharding, NoSQL Data (and eventual consistency), and CQRS. Watched Udai Ramachandran talk about Windows Azure AppFabric Caching in the final session. 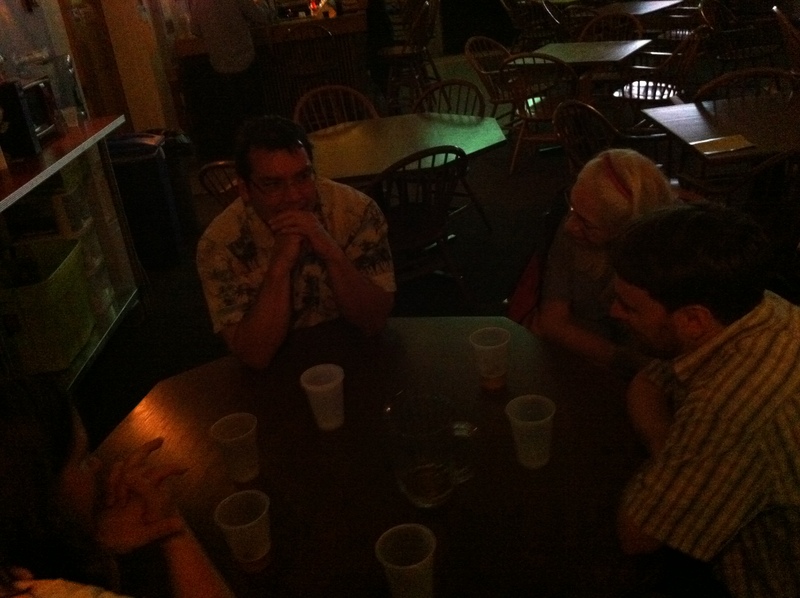 This entry was posted in Azure, Bill gave a talk, Cloud Computing, Events, Trip Report on June 4, 2011 by Bill Wilder. Today at TechEd in Atlanta, I served as discussion leader for a Birds of a Feather (BOF) session on Scaling Cloud Applications. The session had around 20 people in the room, and an unknown number watching the live stream, some of whom actively participated over Twitter. And especially those who joined me on stage in the “Bird’s Nest” as very active contributors: Jason Milgram (Windows Azure MVP, CEO of Linxter), David Pallmann (Windows Azure MVP, GM at Neudesic for Azure practice), Aaron Drenberg (Software Architect), and Artem Kazmerchuk (Software Architect) – thank you guys! The BOF events were very well run by the INETA team (Chris Pels and a few others). If you want a more structured treatment of some of the same scalability concepts, feel free to check out my talk on Cloud Scalability Patterns coming on June 1/June 2 via the GITCA “24 Hours in the Cloud” event. Here is the generic event description – follow the link to find out when my talk is slotted in. Come and get your Cloud geek on! On 1st June, 2011 GITCA and Microsoft are running an event called “24 Hours in the Cloud”. There will be 24 one hour sessions around the world covering a wide range of Cloud Computing topics. The presenters will be live on twitter to answer your questions. I will be one among them. There is something for everybody, developer, IT pro and SQL enthusiast. There is no question that Cloud Computing is here to stay and this is a unique opportunity to be educated and gain an insight as to where Cloud Computing is going. Stay tuned for more details, such as how to join the “Cloud 24 hour party”, as the event date approaches. If you have more questions on the topic, feel free to put in on twitter (@codingoutloud), you can comment on this blog post, or you can email me (coding out loud at gmail). And, finally, below you can find the Twitter stream from the live event – latest on top, earliest on bottom – (which I salvaged via research.ly). Scale on! Mobile apps are a big area for growth in the cloud computing area. 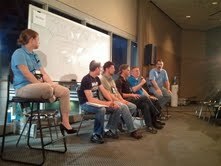 Talking about moving existing apps to the cloud as we near the session conclusion. Would be nice if the Azure platform would monitor and scale for you. @techedbof2011 Thanks for asking my question. I am watching this live event. @techedbof2011 #bofdev #msteched Can we scale up for certain period in an year? #BOFDEV sessions at all yet! Cloud applications #msteched #bofdev << will be heckling from afar! #msteched #bofdev << will be heckling from afar! 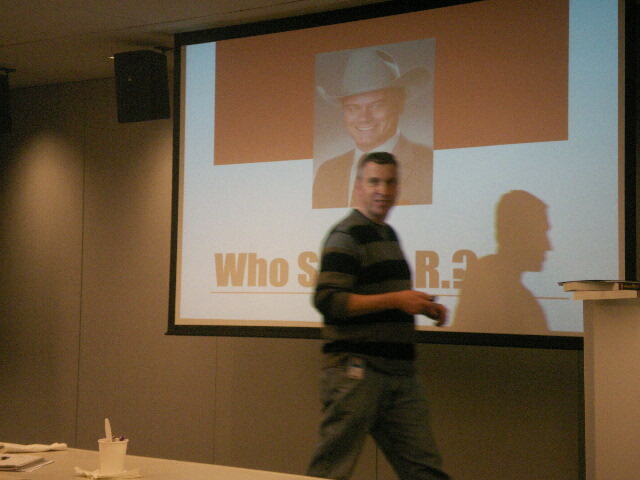 This entry was posted in Azure, Bill gave a talk, Cloud Computing, Events, Trip Report on May 18, 2011 by Bill Wilder. At my talks, I mentioned the Windows Azure Pass – a 30 day FREE pass for using Windows Azure Compute (IIS or Worker Roles), SQL Azure, Azure Blobs/Tables/Queues, etc. If you didn’t get a handout at talk, no worries! – You can still access the offer: Go here and use Promo Code BILLONAZURE. Let me know if you have any questions or if you use the promotion. Richard‘s talk on becoming a better developer. 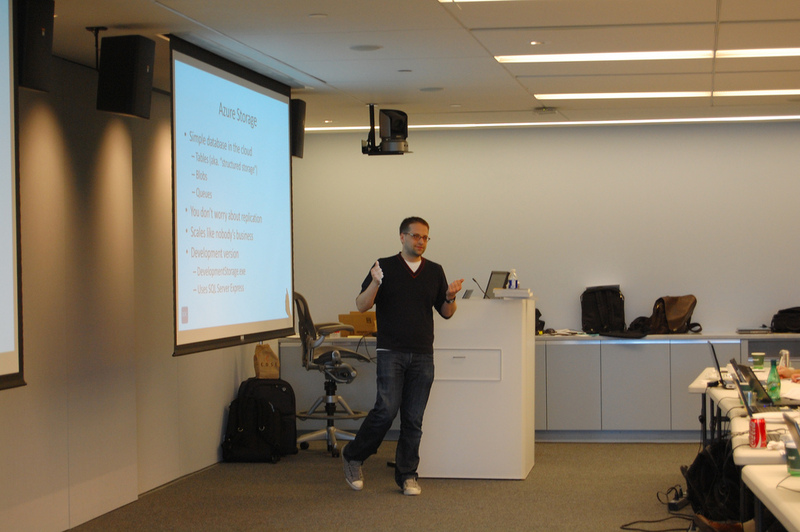 Ben Day‘s talk on 7 Lessons Learned during his first large Silverlight dev project. Find out more by reading Ben’s article on same topic, starting here. Steve Maier‘s talk on using Azure-hosted WCF services to serve as your mobile application’s back-end. Chris Bowen on HTML 5. Many thanks to Chris Pels, Chris Bowen, and especially Patrick Hynes for such a great event! Thanks also to Telerik and Wintellect for sponsoring our food! 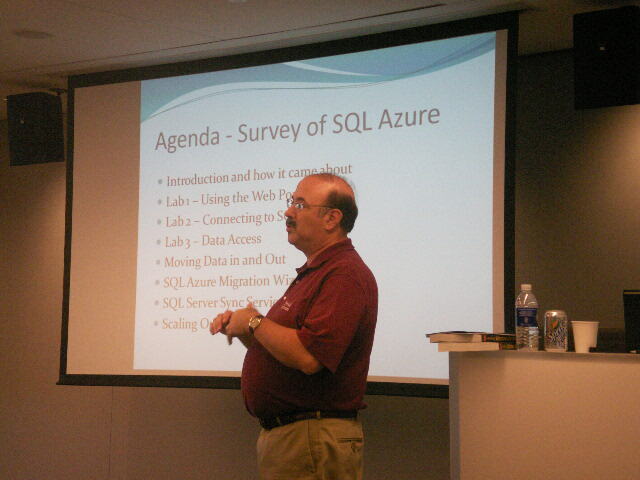 This entry was posted in Azure, Bill gave a talk, Cloud Computing, Events, Trip Report on May 7, 2011 by Bill Wilder. 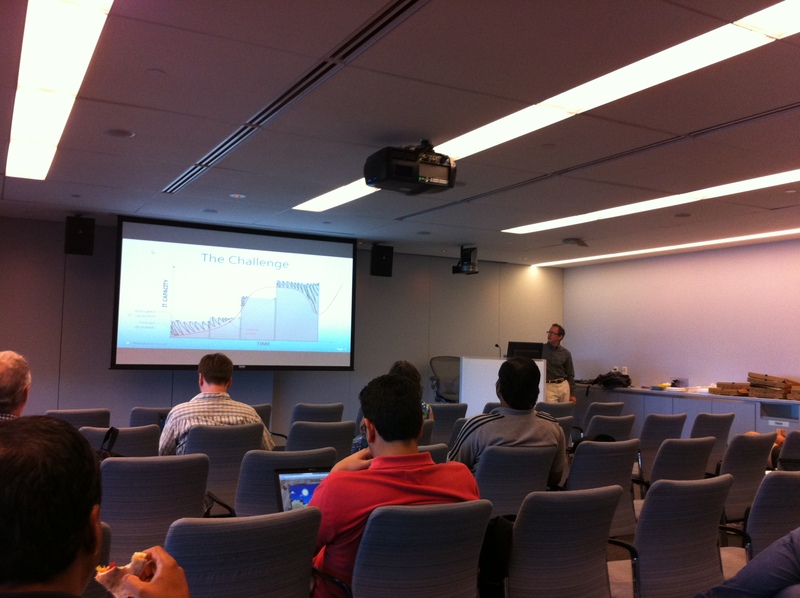 Boston Azure Firestarter a Success! 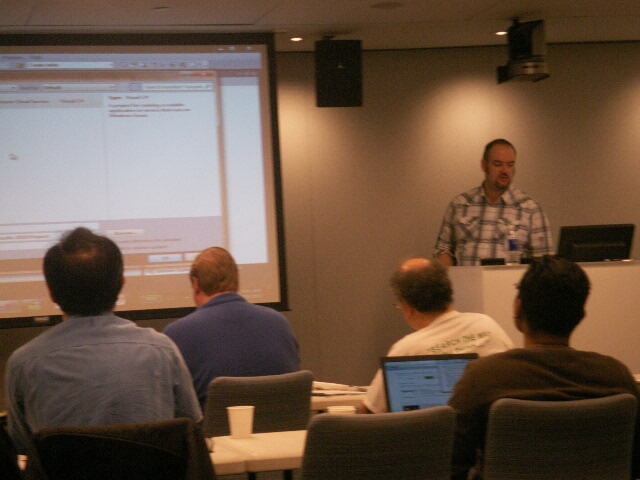 We had 60-something folks attend the Boston Azure Firestarter (more photos) on May 8, 2010 in Cambridge, MA. This event provided both talks about important Azure concepts and hands-on-roll-up-your-sleeves-and-write-some-code Labs. Yes, attendees brought laptops! Feedback was positive. Many thanks to all the folks who helped make this event possible. 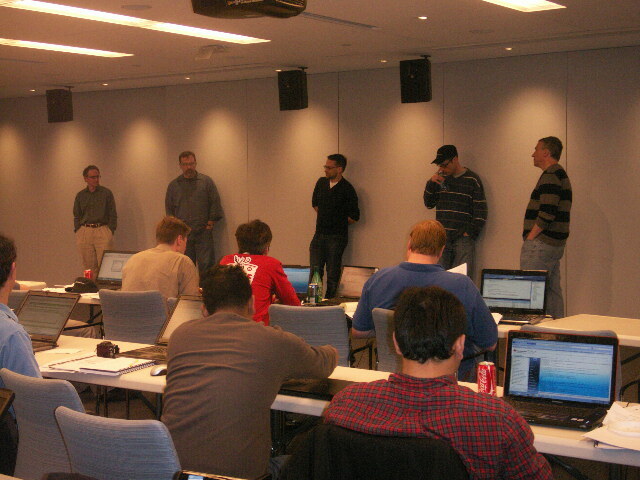 This was a Boston Azure cloud computing user group event, supported by and hosted at Microsoft. 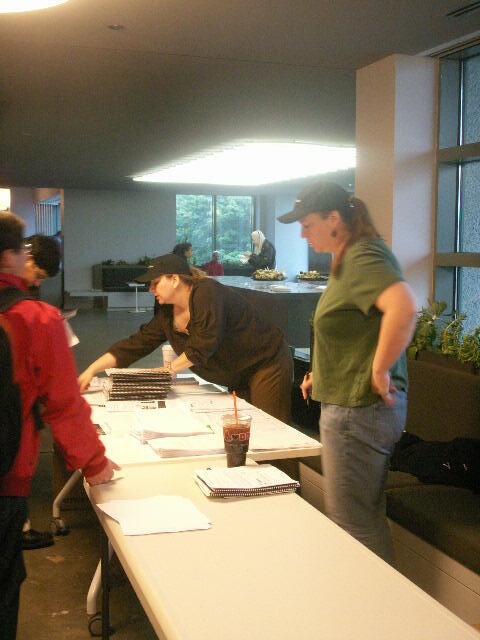 Those who helped prepare for the event, work the sign-in desk, help with technical problems, and handle the pair-programmer matching service included Nazik Huq, Chander Khanna, Joan Linskey, and Maura Wilder. Jim O’Neil and Chris Bowen (our East Coast Microsoft Developer Evangelists) were also on hand for trouble-shooting and general support and help. David Aiken from Microsoft’s Windows Azure team came from the left-coast in Redmond to the right-coast in Boston to keynote the event. David gave many demos, a couple of which were My Azure Storage and his new URL shortening service hmbl.me. 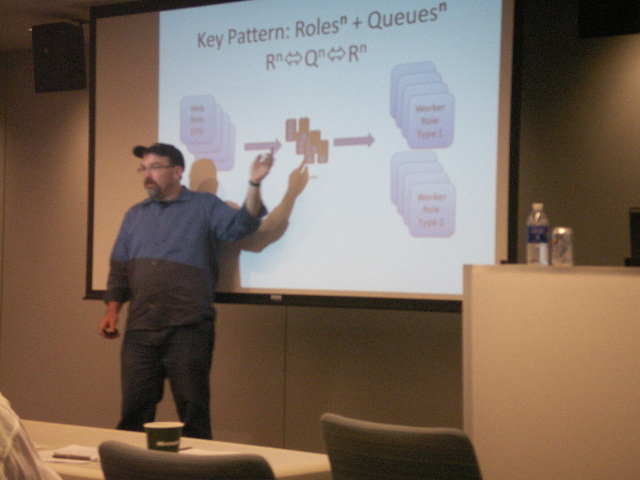 This entry was posted in Boston Azure User Group, Programming, Trip Report on May 22, 2010 by Bill Wilder. Are you working on the site? –> Yes ==> test now! Keep yourself out of it! It is about the user and what the user being tested is thinking. Have high quality snacks. Keep the sessions short and compact. Do them on site. Make it easy for everyone to join in, hard to have a good reason to skip it. Record sessions with Camtasia ($300). Get a good USB desktop microphone ($25). Don’t record user’s face (“useless and distracting”). Use a screen sharing service (like GotoMeeting, $40/month?) to control the UI. High quality audio is important, and should be channeled to the observation room via GotoMeeting or Skype. Serious because everyone will come across them, or serious because for those who do encounter them will be seriously impeded. Ask everyone in the observation room to write down the three most important issues they observed. These are raised at the debriefing session over lunch. Sometimes a tweak is better than a redesign – don’t get suckered into a redesign – the perfect is the enemy of the good! Remote testing is handy – saves travel time, recruiting pool grows, … do over skype or GotoMeeting. How to get it off the ground? Try a group usability test of competitor’s site – everyone can get behind that. Do one and hope people get enthused about it. Make the cost of swinging by to watch the testing really small. Be very cautious about asking users how to fix the problems they’ve encountered. “Users are not designers.” “Hopefully you know a lot more than they do about design.” Listen to them, but be careful that they’re ideas are not well thought out. The purpose of testing is to “inform your design intelligence”. This entry was posted in Trip Report, UX on February 7, 2010 by Bill Wilder. Bill Wilder - experienced developer and architect focused on helping individuals and companies succeed in the cloud using the Azure cloud platform. Stupid Azure Trick #2 – How do I create a new Organizational Account on Windows Azure Active Directory without any existing accounts or EA? Azure FAQ: How much will it cost me to run my application on Windows Azure? Are you missing an assembly reference? Why, yes I am. So kind of you to ask.